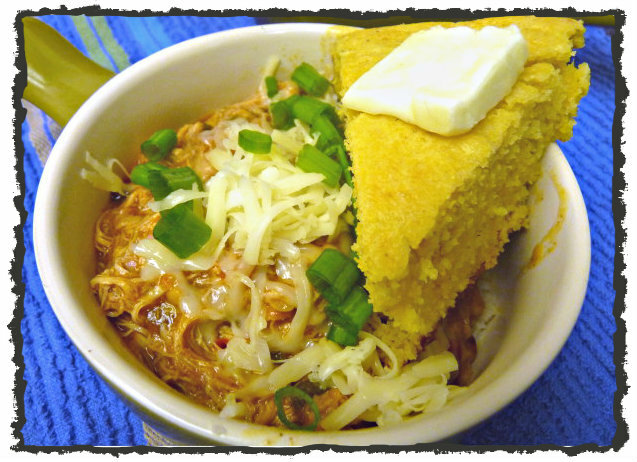 I decided while Mrs. G’s chicken chili was cooking away that I wanted some cornbread to go along with it. I’m not particularly fond of cornbread that has a sweet flavor. No, I like mine to have just a bit of heat…..and maybe some cheese (don’t worry, this does not have a bunch of heat, but if you want more, sub in jalapenos for the green chiles). While we were sitting on the back patio, listening to the rain come down, I was pondering if I really wanted to make cornbread when I spotted my Egg. Making cornbread on the Egg has been something I’ve been wanting to try for awhile…why not attempt it now while Mrs. G already has dinner covered? 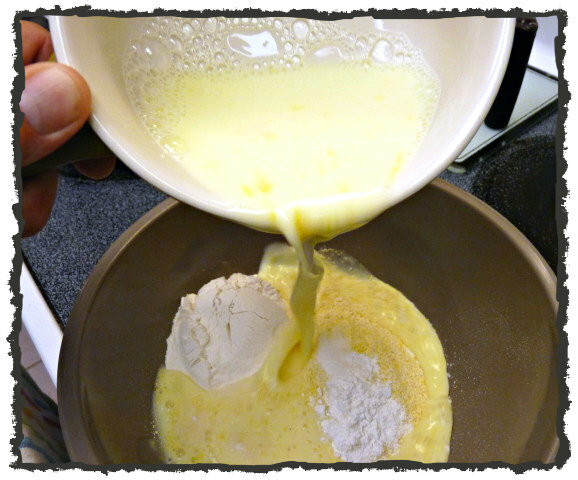 Whisk together 1 egg, milk and vegetable oil/shortening in a separate bowl. 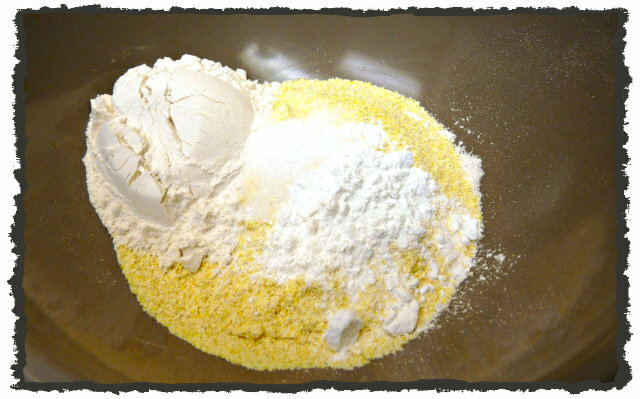 Add egg mixture to the dry ingredients. 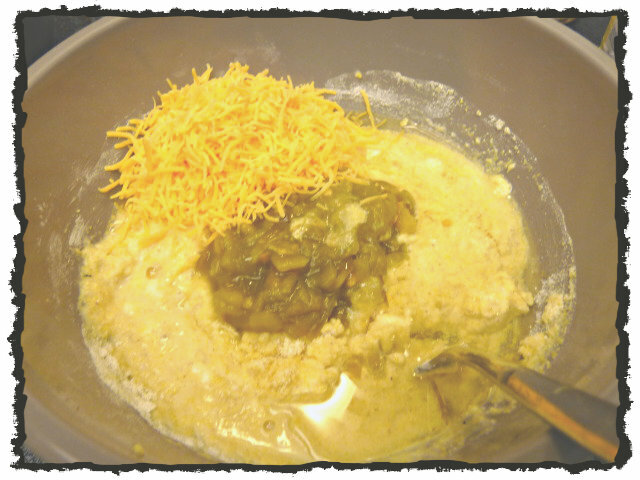 Add 1/2 cup shredded cheddar cheese and diced green chiles and stir until well mixed. 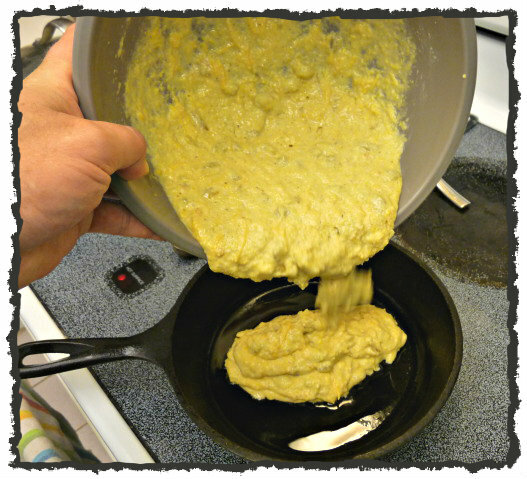 Carefully pour the cornbread mixture into the hot cast iron skillet. You should hear it begin to sizzle. This means you are going to have a nice crust on the bottom of your cornbread. Cook the cornbread for 20 -25 minutes, or until a toothpick inserted in the center comes out clean. Almost done!! Is your mouth watering yet? Slice the cornbread, slather with butter and enjoy. Serve it up with some of Mrs. G’s white chicken chili or whatever else sounds good to you. 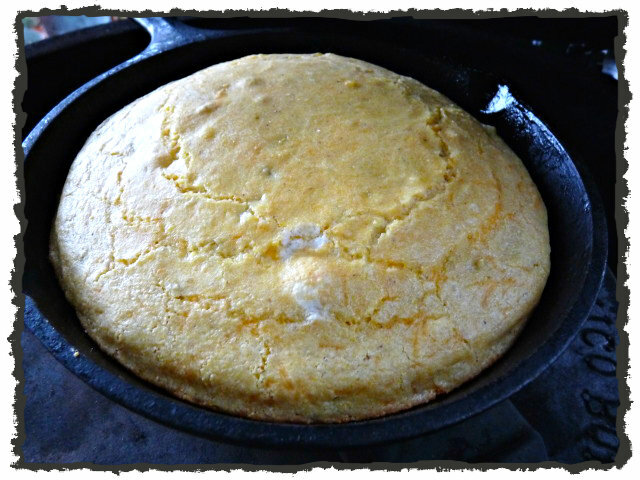 Mmmmm….love me some cornbread and cooking it on the Egg, while not necessary, sure was fun (I’ve been doing this in the oven for years). Will I do it again on the Egg? Possibly, especially if it’s the middle of the summer and I don’t want to turn on the oven and heat up the house. Go ahead and take this recipe and make it your own. Switch up the cheese if you want to or have a favorite. Sub in jalapenos or other peppers if you want to play around with the heat level. Just be sure to come on back, let me know what ya tried and how it worked out for ya. Stick some bacon in it and invite me over🏃 Mickey Ps: I like to use the candied jap’s for the light heat. That sounds like a great idea, Mickey! Thanks, Mickey. Right now I’ve actually got it hosted on a free blog site. Maybe someday I’ll upgrade it and pay for some of the fancier background themes and such, but for right now I’m just keeping it simple an free. It’s also a wonderful tool for me to keep track of my recipes, especially if I’m at the store and forgot my list, I can look up the ingredients on the blog on my phone. Would love to make it to Salado, gonna try real hard. Give Nelly a scratch behind the ears for me. If I was there, there wouldn’t have been any left for you. Yes, my mouth is watering for this. I also put corn and cheese in my cornbread. So good! Dude, the cornbread looks great. I know you were dissing the wife’s chicken chili, but it also looks fantastic. Thumbs up to both of you! How was I dissing her chili? Thank you so much. 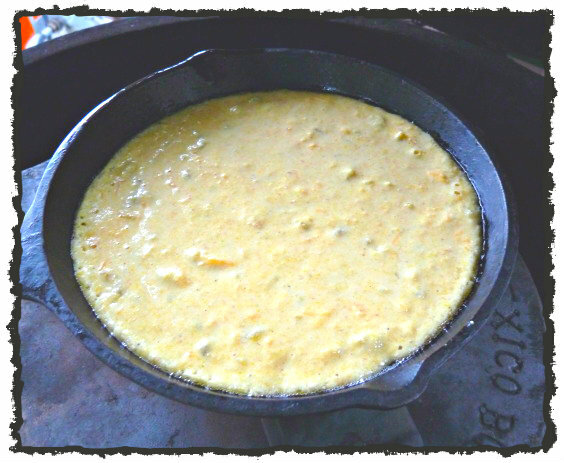 It is KEY that you preheat your skillet prior to adding the batter (you can always do this in the oven). You want to hear a nice sizzle when you pour it in. 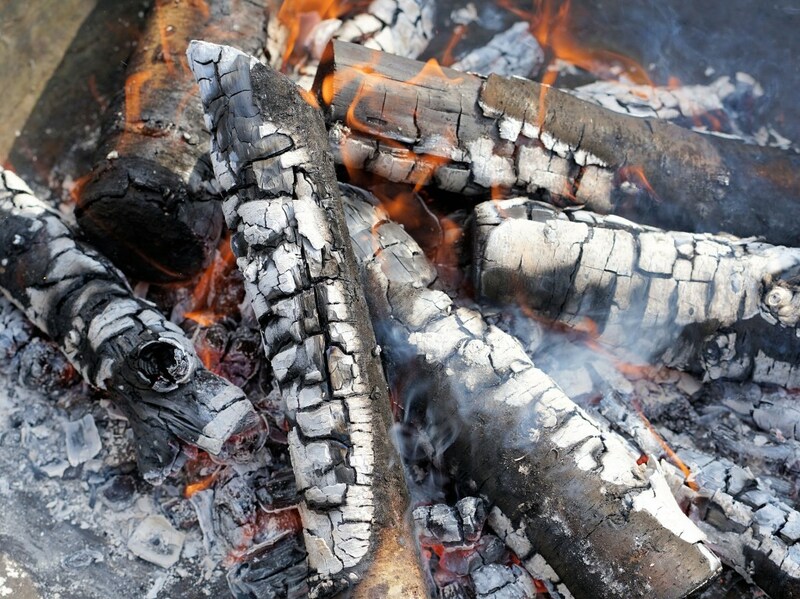 And with the heat retaining abilities of the cast iron and maybe some aluminum foil on top, it would probably stay warm. I love cornbread with a kick, looks fantastic! I love me some good cornbread, especially with a little kick! Your cornbread looks yummy. I don’t like it sweet either. Sacrilegious. We are having chili day at work on 10/1 and I am bringing cornbread. They wanted me to make tamales but that is too much work. I didn’t want to commit to it. I need to get a good cast iron skillet that will fit on my Egg! Hey bud you say add a tbsp or 2 to the CI….I assume you mean oil cause that’s what it looks like but am I wrong? No, you are right. My bad. I’ll go bac k and fix that. Sorry Iweve had nothing new lately, Jackie has been on a course all week and I’ve been working in a winery in Niagara (and tasting a lot of wine 😉 ) and i have the camera with me. Anyway, I hope you like Jason’s corn bread recipe! It looks great!